Lot 29. Sir Anthony van Dyck (1599 - 1641), Portrait of Charles II (1630–1685) when Prince of Wales, oil on canvas, in a carved wood frame, 158.8 x 109.2 cm. ; 62 1/2 x 43 in. Estimate 2,000,000 — 3,000,000 GBP. Lot sold 2,620,000 GBP. © Sotheby's. London, National Portrait Gallery, Van Dyck in England, 1982, no. 63. A. Busiakiewicz, Armour in the British Portraits of Sir Anthony van Dyck, MA diss., London 2014, p. 45, reproduced fig. 51. 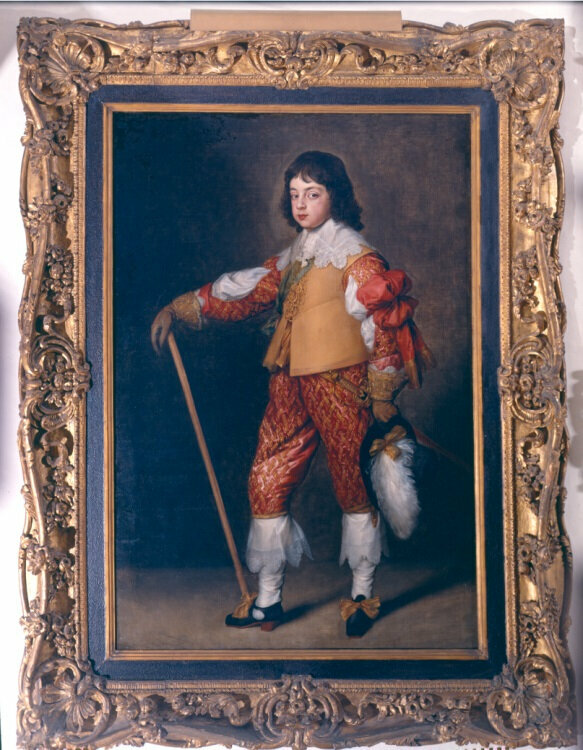 Note: This portrait of the eleven year old Prince of Wales, later King Charles II, and the following portrait of his nine year old sister Mary, the Princess Royal and newly married Princess of Orange were among the last, if not the very last, works that Van Dyck was able to paint for the court of King Charles I. Both were conceived and executed in the summer of 1641, soon after Mary’s marriage to Willem II, Prince of Orange here in London. Thereafter political events in the capital, in which ‘all things hastened to confusion and calamity’ with the onset of civil war, combined with the deterioration of Van Dyck’s own health to mark the end of his long and glorious career, for he was to die in London before the end of the same year. Indeed, it is quite possible that these are the portraits of the Prince and Princess that were among his possessions left in his studio in Blackfriars following his death. Both these pictures epitomise the extraordinary skill which Van Dyck brought to child portraiture, a genre in which he had excelled ever since his early years in Genoa. They provide penetrating and sympathetic likenesses of the royal children at a time when their world and that of the Stuart monarchy was in the process of collapse. 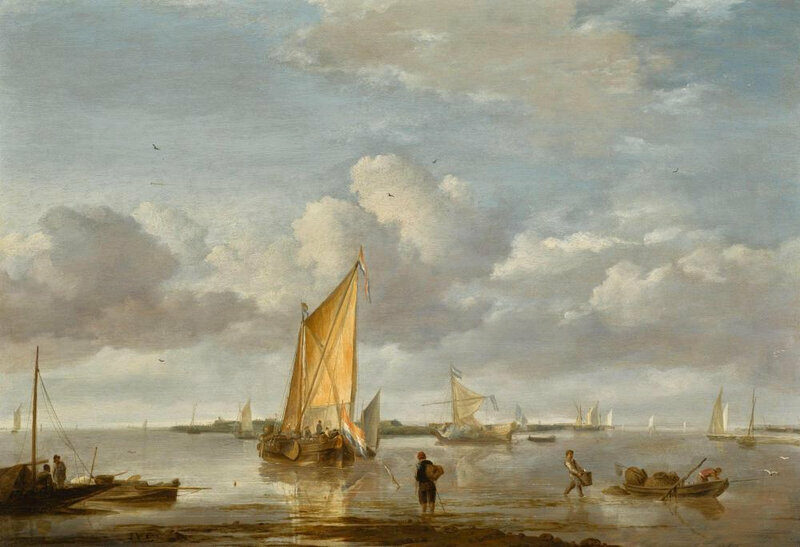 These rare late works, which have come down to us in exceptionally fine condition, appear here on the market for the first time in just under a century. 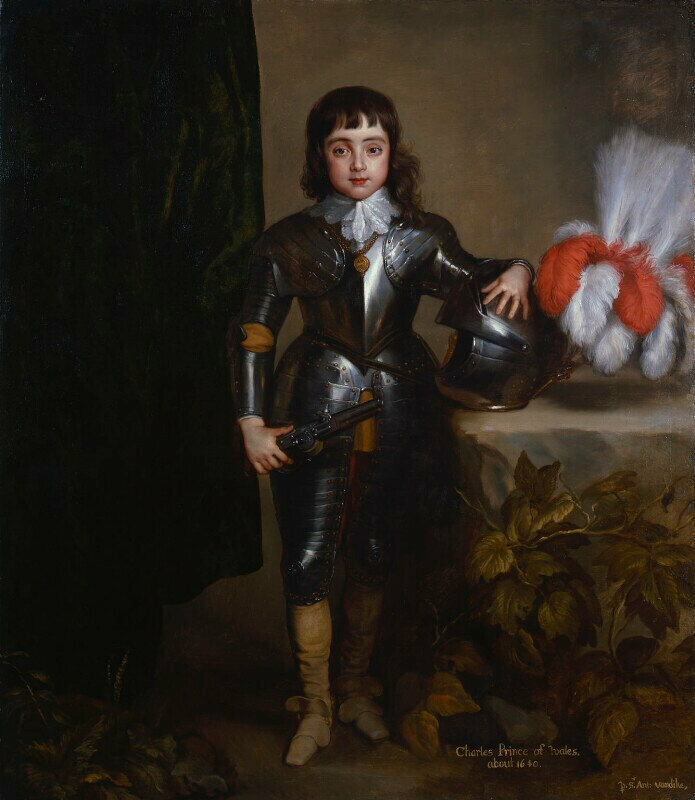 This portrait of Charles, the eldest son of King Charles I of England, was one of the very last royal commissions entrusted to Van Dyck before his death. The Prince is shown in armour, wearing the Order of the Garter, and holding a staff of office, indicative of his high social rank. 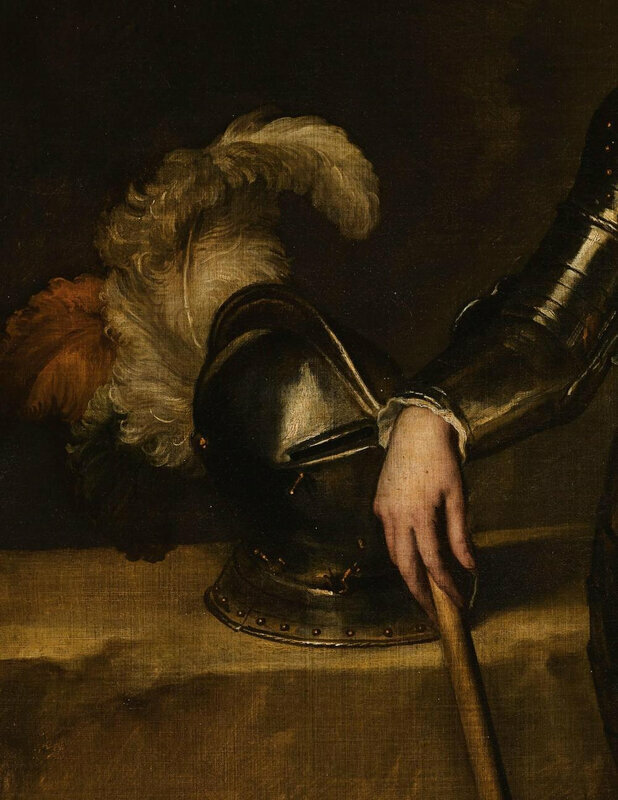 His plumed helmet rests upon a stone ledge beside him.1 It is one of two very similar portraits of the prince painted at this date. The other is that now in the Newport Restoration Foundation in Newport, Rhode Island (fig. 1), in which Charles is shown in a less formal military buff surcoat and the Garter, again holding a staff and a feathered cap.2 The likeness and the lace collar are very close in both portraits, suggesting that they may both depend on the same ad vivum sitting, and thus could well have been worked on together in Van Dyck’s studio in the last months of his life. They can probably be associated with a payment to the Master of the Prince’s Barge for the use of a barge which on 9 August 1641 had ‘caryed his highness from Lambeth to Whithall and from thence to Sr Anthonye Vandickes and back again.’, no doubt so that the young prince could sit for a portrait.3 A number of early replicas of the Rhode Island canvas are known, but the present portrait seems to be the only version of this particular composition to have survived.4 By this date Charles had passed his eleventh birthday, and this portrait seems to mark a distinct shift in his representation away from the celebrated child portraits painted alongside his siblings by Van Dyck between 1635 and 1637. By contrast with Van Dyck’s slightly earlier full-length depictions of the Prince in armour, such as that painted for the Queen’s gallery at Somerset House and still in the Royal Collection, and the largely studio version in the National Portrait Gallery in London (fig. 2), which are both derived from the celebrated childrens’ group portrait of 1637 at Windsor Castle, we see here a far more adult portrayal of Charles. A far more martial and adult gravitas is displayed in both accoutrement and bearing, which was quite deliberately intended to underline both his royal status and that of his importance as male heir to the throne, of great significance at a time when the monarchy and the Court were subject to ever mounting criticism. The staff or cane that he carries, which consciously recalls those found in Van Dyck’s portrayals of the King in the hunting field, most notably the famous canvas today in the Musée du Louvre in Paris, echoes this development. fig. 3. Sir Anthony van Dyck, Portrait of Prince Charles Louis (1617-1680) Elector Palatine, c. 1641. Oil on canvas, 107.3 by 92.7 cm. Private Collection. © Sotheby's. 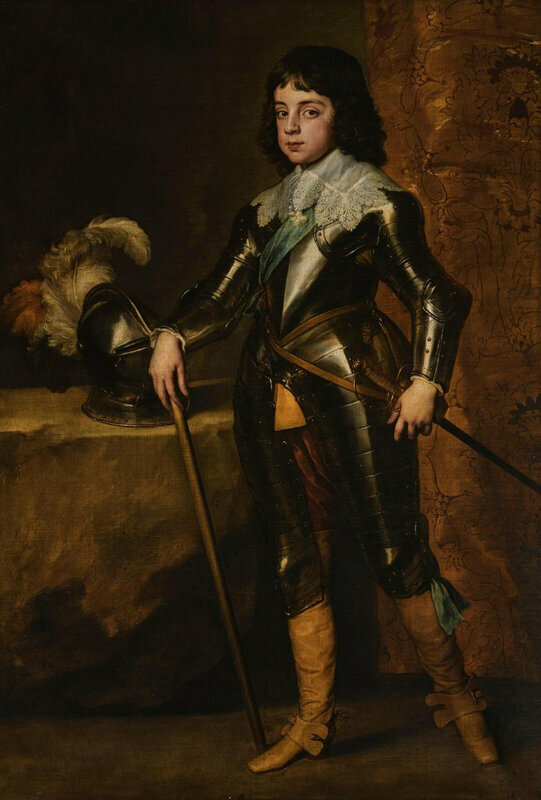 Although he was still only twelve, the year after this portrait was painted the Prince of Wales joined his father Charles I at the outbreak of the English Civil War, and he was present at the battle of Edgehill in October, where he reportedly cried defiantly ‘I fear them not!’ when advised to leave the field. Although he did later personally participate in the campaign, by 1646 it was clear that his father was losing the war, and Charles was obliged to flee England for his own safety. He took refuge at the court of his cousin Louis XIV of France in Paris, but he struggled to find substantial support for his family either there or in the Spanish Netherlands. 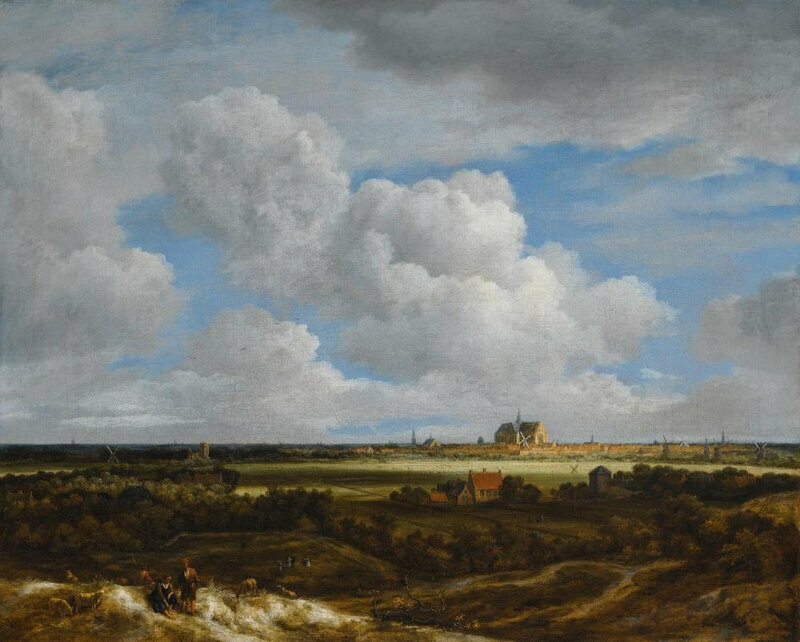 In 1648 he visited The Hague and the court of his sister Mary and her husband William II of Orange, but found the Stuart cause there equally unpopular with the Protestant Dutch. The following year, in January 1649, his father King Charles I, who had been in captivity since 1646, was executed, and England became a republic under first the Commonwealth and later Cromwell’s Protectorate. Successive campaigns undertaken by Charles in alliances with the Scots ended in heavy defeats at Dunbar (1650), and Worcester (1651). After the latter battle Charles was forced into hiding, only narrowing avoiding capture by the Parliamentarian forces by hiding in a famous oak tree at Boscobel. Although Charles finally reached safety in France, the Parliamentarians’ grip on England was not threatened again. It was only with the death of Oliver Cromwell in 1658 and the resignation of his son Richard as his successor as Lord Protector that a re-formed and repentant Parliament voted to restore Charles to the throne. On the 29 May 1660, on his thirtieth birthday, Charles was received in London to popular acclaim but with much reduced powers. Thereafter he would become one of England’s best-loved monarchs. The celebrated hedonism of his court seems to have come as a very welcome relief after so many years of Puritan rule. The father of no less than fourteen children by his various mistresses, Charles unfortunately left no legitimate heir by his long-suffering wife Catherine of Braganza. He was succeeded by his brother James, the last Roman Catholic King of England, but after a brief and bloody reign he was deposed and the throne offered to Charles’s sister Mary’s protestant son, William III of Orange. However, through lines of descent from Charles’s children, notably the subsequent Dukes of Richmond and Grafton, to the late Diana, Princess of Wales, Charles’s descendants are now once again re-connected to the English throne. As and when he succeeds to the throne, Prince William, Duke of Cambridge, will in due course become the first English monarch to be descended from Charles II. We are grateful to both Dr. Christopher Brown and Dr. Malcolm Rogers for independently endorsing the attribution following first-hand inspection of the original. The early history of this painting and its companion remains unclear. They may be the portraits of Mary and her brother Charles recorded as being left in Van Dyck’s studio at the time of his death, but whose subsequent history remains obscure (see note to the previous lot). However, it is quite possible that they may have hung at Raynham Hall in Norfolk (fig. 4) since the seventeenth century. They are certainly recorded there in the old inventories taken in 1810. An earlier inventory made for the 1st Marquess in the 1770s also lists several portraits attributed to Van Dyck, but the references are often generic. For example, in Queen Anne's Parlour hung 'Some Van Dyke & some by Cornelis Johnson' [sic], while in the stone Parlour 'one by Van dyke' hung over the chimney. From the outset, the collections at Raynham contained an important collection of seventeenth century portraits, the majority of which (including the present work) were dispersed at auction in 1904. Their nucleus was a group of Dutch portraits by Miereveldt commissioned by Horace, Lord Vere of Tilbury (1565-1635) depicting himself and the principal officers who had fought alongside him in the Dutch wars of the early seventeenth century, and which had been brought into the family by the marriage of his daughter Mary to Sir Roger Townshend (1596-1637) of Raynham. 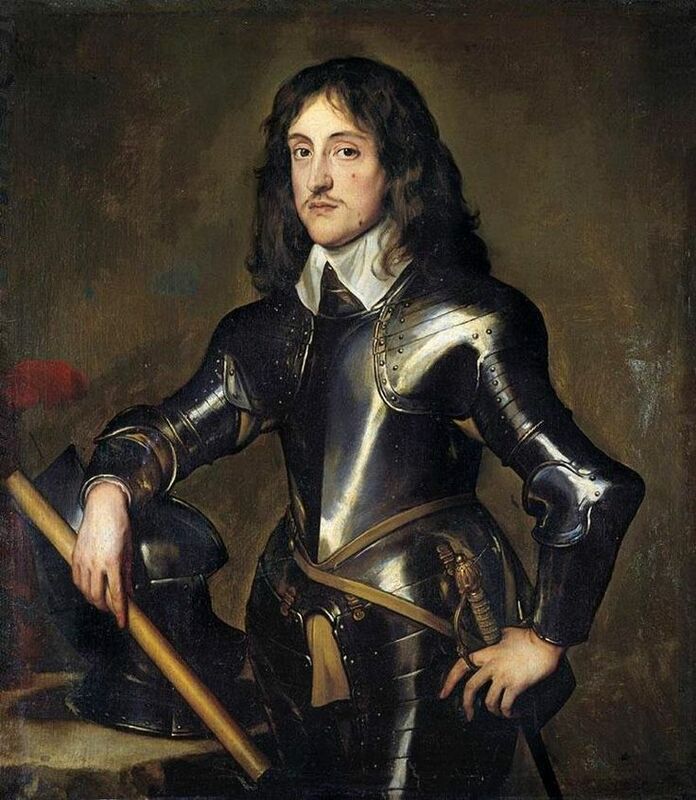 To these were added several other portraits of the principal personalities of the day, including Charles I, Prince Rupert and General George Monck, alongside their opponents, Cromwell, Fairfax and Ireton. However, it seems that during the Civil War as well as the Commonwealth and the Protectorate that followed the family maintained careful diplomatic relations with the Parliamentarians. Lady Vere, who outlived her husband by some thirty five years, briefly had charge of Charles I’s two youngest children in 1645, and Clarendon reported that she was ‘much in their (Parliament’s) favour’. It is most likely that the pictures entered the collections at Raynham after the Restoration. The links between Charles II and the Townshend family were strong indeed, for Sir Horatio Townshend, 3rd Baronet (1630-1687), was one of the select group of noblemen selected to travel to Breda in the Netherlands and bring back Charles at his Restoration in 1660. This was an enormous honour and Sir Horatio was elevated to the peerage as Baron Townshend the following year. Under his aegis Raynham was immediately remodelled and enlarged between 1661 and 1666. In September 1671, King Charles himself and his brother James, Duke of York visited the house. Charles was extremely conscious of the power of his image as monarch, and it is not altogether fanciful to suppose that the new Lord Townshend would have been anxious to acquire and display portraits of his new monarch, or even that both portraits may have been the gift of the King himself. 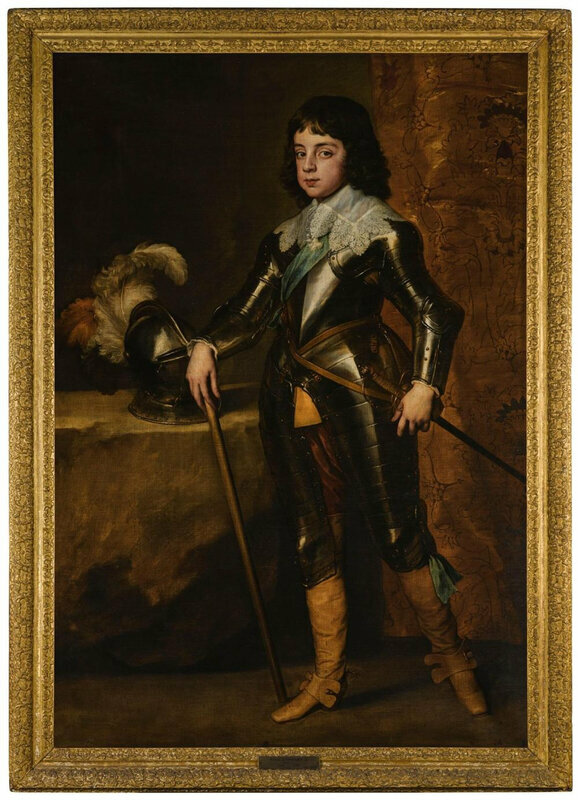 1 Although there is no surviving royal suit of child’s armour which can be linked to this portrait, a similar suit survives today in the collections at Warwick Castle. The armour seems to have been fairly standardised for Van Dyck’s male portraits of this period. The helmet is here of a more continental, and specifically Dutch fashion. 2 Millar 2004, pp. 483–84, no. IV.67, reproduced. The portrait is traditionally said to have been painted for the Countess of Chesterfield. 3 British Library, Add. MS 32476, f. 21. Cited by Millar 2004, p. 483. 4 Millar lists versions, for example, at Goodwood House, Boughton and Muncaster Castle. Another was sold in the these Rooms, 12 July 1995, lot 18. 5 C. Brown and N. Ramsay, ‘Van Dyck’s collection: some new documents’, The Burlington Magazine, vol. 132, October 1990, p. 707, Appendices II and III. 6 As Price had died intestate, both Andrews and Wittewronge were no doubt motivated by a desire to avoid the pictures falling into the hands of the ‘Committee for Seizing and Sequestering the Estates of Delinquents and Papists in the City of London’. Lawsuits against the Price family seeking recovery of the money originally owed by them continued as late as 1704. 7 According to Gibson 1997, a portrait of Prince Charles remained in the collection at the Wittewronge family seat at Rothamsted in Hertfordshire until early in the last century, but this too is now untraced. 10 For which see the Catalogue of Italian Pictures… collected by Robert and Evelyn Benson, Chiswick 1914.